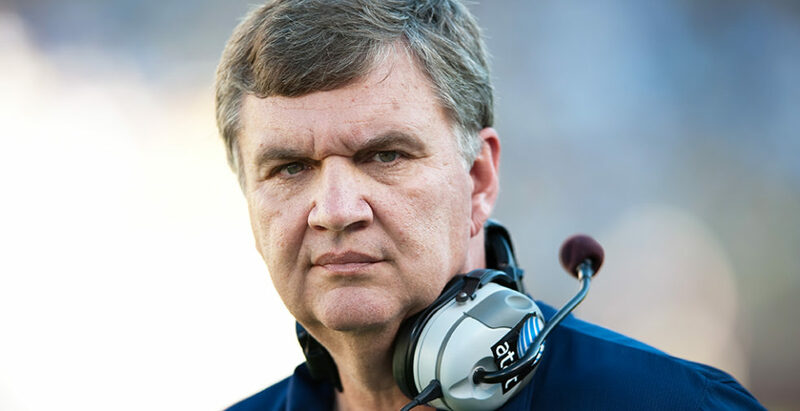 The face of Tech football for more than a decade, head coach Paul Johnson announced his retirement on November 28. He is the godfather of the modern triple-option style offense, almost single-handedly keeping the scheme alive through his coaching and the work of his former proteges. In his career at Tech he took the team to an 82-60 mark — not including an expunged ACC Championship game win — along with a 3-6 bowl-game record. Johnson’s legacy in terms of outlook across all of college football is obvious; no coach has done more to keep alive the ancient art of the flex bone. Since his first tenure as a head coach at Georgia Southern — where Johnson led the Eagles to two national championships in five years — many of Johnson’s coaching assistants have gone on to implement their own triple option styles at other schools. The style is a hallmark of any U.S. service academy, and the puppet master behind nearly every program that runs the scheme is likely a graduate of the Johnson School of Running the Ball. But Johnson’s legacy at Tech is far more complex. Johnson performed surprisingly well in his first two years as head coach at Tech, going 19-7 and picking up the aforementioned ACC Championship, but Johnson lost four straight bowl games to begin his tenure. Still, Johnson was nothing if not consistent as the Jackets reached bowl eligibility for seven straight seasons from 2008 to 2014, culminating with arguably the greatest Tech football team since the 1990 team that captured the national championship. The hangover of Tech’s 2014 Orange Bowl victory persisted through the 2015 season, however, as Tech went 3-9 and completely missed out on the postseason. Despite a more-than-solid rebound in 2016, the memory of that 2015 season coupled with recent struggles caused fans’ patience to wear thin for the 2017 and 2018 seasons. Despite pressure from fans, Tech stuck by Johnson, offering him a contract extension in 2018 after Tech went 5-6 the previous season and narrowly missed the postseason. A year after signing that extension, seen by many as a signal of the administration’s faith in their coach, Johnson elected to walk away on his own terms. In terms of success, on paper, Johnson appears as a capable coach and not much more. To be sure, reaching nine bowl games in eleven seasons is a feat in and of itself, but bowl game eligibility is expected of any self-respecting Power Five program — especially one with as storied a history as Tech’s, which includes names like ‘Heisman’ in its annals. Yet, in context, Johnson’s legacy improves; given Tech’s low investment and low return on athletics, Johnson was able to accomplish quite a lot with quite little. Johnson’s triple option required no flashy, NFL-caliber recruits to succeed. That was a necessity, given Tech’s high academic standards that might dissuade athletes uninterested in taking calculus their freshman year from attending. Johnson’s triple option allowed Tech to find success without compromising academics — a very visible issue at other ACC programs — and without substantial investment in the program, a necessity for Tech’s cash-strapped athletics department. But Johnson’s true legacy is far more important than shiny metal bowls, hugged and kissed only to then be locked away in glass cabinets until the end of time. It is far more important than scratches of a pencil on paper, recording another tally in the “victory” column for the Jackets. It is far more important than the number of graduates who have gone on to become NFL stars, receiving lavish paychecks and jet-setting across the country to play for rapturous applause from fanbases starving for championships. Johnson’s true legacy is that of every player who has passed through his program. The responsibility of a college football coach is unique, as the players are still developing from teenagers into men and are not simply showing up to a job each day to earn a paycheck. Johnson is responsible not just for developing and mentoring these players in the realm of football, but in life. Every player that walks onstage to shake the president’s hand and receive a diploma is another success for Johnson and his staff, and Johnson has graduated plenty. For many disadvantaged athletes, football represents a chance at a better life, and as a coach, Johnson represented a facilitator of opportunity, serving admirably in this role. That, more than win percentage or strength of schedule or redzone efficiency, will be the metric that defines Paul Johnson’s career years from now, particularly if he stays retired and never ventures onto the sideline of a college football stadium again. Students in the years to come may not know what a B-back is, why it matters that cut blocks are a perfectly legal and acceptable part of a football game or how Tech once won games against tough opponents while almost never passing the ball. May they remember, at the very least, the impact Paul Johnson had as a fervent advocate for and shining example of what Tech athletics can be.